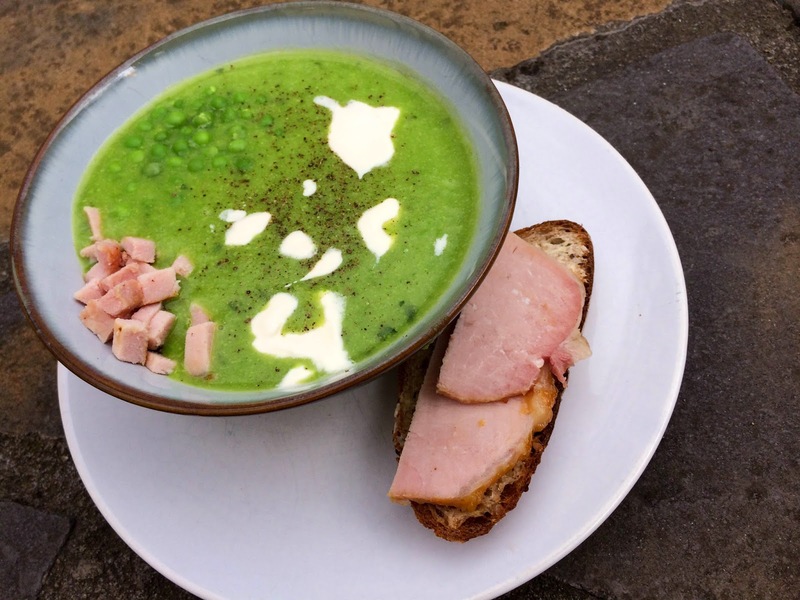 Pea and ham soup, the ultimate winter comforter, isn't just for winter. For a start, the most traditional of the soups uses dried split peas, soaked overnight and cooked for until the peas collapse and release their starch, creating a soup so thick you can stand your spoon up in it. There's a time and a place for these soups; for me, mostly around the festive season, using a stock made from the bone of the Christmas ham. 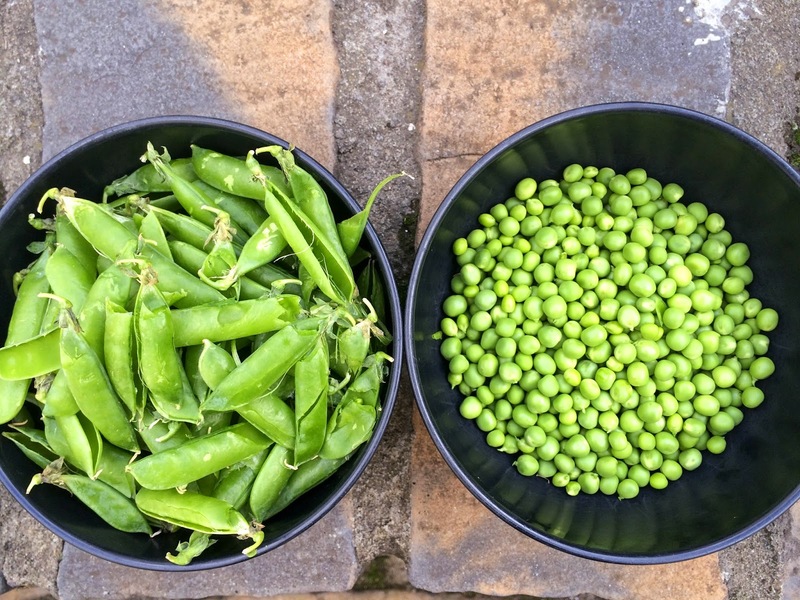 In the summer it's just as feasible; a big bag of peas in their pods, painstakingly shelled is how I made mine with some frozen peas to bolster them, but you can also use only frozen peas for ease and to save on time. It's the gammon that needs a little attention. I used a small lump from the butcher - poached gently in water with some aromatics to create a smoky stock, it was then fished out, de-skinned and roasted with a layer of mustard and sugar for crisp and flavoursome fat. Cold or hot, this soup was accompanied with a ham sandwich for dunking in. 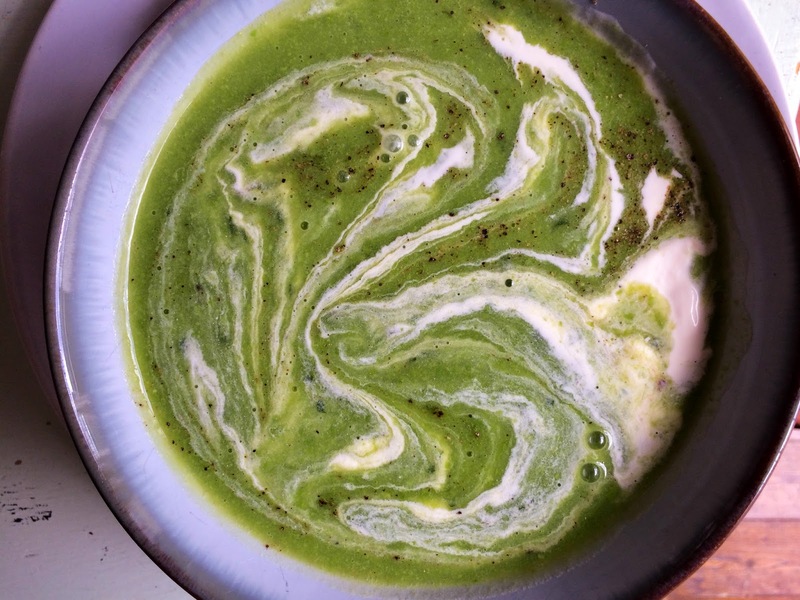 I don't make soups often, but when I do they have to be textured; there's no danger here of getting bored of every mouthful being the same. 3 medium sized floury potatoes, peeled and chopped into a small dice. In a large saucepan, place the gammon joint in with enough water to cover and bring to the boil on a high heat. Boil for 3 minutes, then take off the heat and throw away the water. Rinse the joint and the pan and fill again with 2 litres of water. Add the onion and half of the pea pods, put the lid on and bring to a gentle simmer for 45 minutes on a gentle heat. Preheat the oven to 220 degrees C and line a baking tray with foil. Remove the gammon joint from the broth and leave to cool for 10 minutes. Meanwhile, strain the stock into another saucepan and discard the onion and the pea pods. Add the potato and place on a medium heat. De-skin the gammon joint, leaving a thick layer of fat and score it in a criss cross with a knife. Mix the mustard and the sugar together in a small bowl and slather on the gammon thickly. Place in the oven to roast for 15 minutes, then leave to cool. By now, the potato should be soft. Add 2/3rds of the peas and all the frozen peas and simmer for 5 minutes, then take off the heat, add the mint leaves and blend using a blender or a stick blender. Add the remaining peas back in and simmer for another 3 minutes, then take off the heat. Divide the gammon joint in half and chop half roughly. Taste for seasoning - it may need some salt. Slice the rest of the ham thinly. To serve, ladle into bowls and decorate each bowl with chunks of ham, a blob of creme fraiche and a slice of ham-topped buttered bread on the side.